For the past five years, the Summer Winter Garden has participated in Philadelphia Horticultural Society City Harvest, a program organized to provide fresh produce to low-income people. 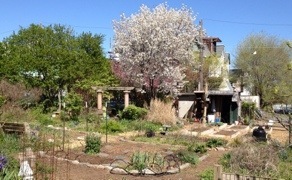 Our plot is the one with raised beds on the east (Center City) side by the shed. The idea is simple: we grow produce from spring to fall and take it each week to the Ralston House residence near Market Street and 38th St., where around 55 low-income senior citizens are in an independent living arrangement. They prepare their own foods and they welcome the fresh lettuce, chard, tomatoes, beans, peppers, basil, and so forth that we provide. Over the season we provide between 300 and 400 pounds of vegetables. Ours is one of 45 participating gardens which together have provided thousands of pounds of produce to low income families. Learn more about Philadelphia City Harvest at the PHS Web site. Gardeners at the Summer Winter Community Garden benefit from extra seedlings, soil enrichment, and salt hay which are provided by City Harvest. They are invited to contribute their surplus for delivery to Ralston House.